If you ever needed to know how much blood does your heart pump every minute, this cardiac output calculator will surely be of help. This article will give you a thorough explanation of how is the cardiac output calculated and provide you with its clear definition. We will also teach you how to use the cardiac output formula (called the Fick equation) and how to assess whether the results are within normal values. Make sure to take a look at the mean arterial pressure calculator for more information on your circulatory system. Cardiac output is the volume of blood pumped through your heart every minute.An average healthy person has a cardiac output of 4-8 liters per minute. Considering that we have about 5 liters of blood in our body, it means that every drop of your blood goes through your heart at least once per minute. The heart really has a lot of work, right? The cardiac index, on the other hand, is the volume of blood that gets pumped by your heart every minute per a square meter of body surface area. This indicator is better for comparing two people who might have completely different cardiac output due to the differences in weight and height. Once you know your cardiac output, you can easily calculate the stroke volume, which is the volume of blood pumped per one heart beat. Cᵥ is the concentration of oxygen in venous blood (also in mL/L). The oxygen consumption can be measured directly using a spirometer. For approximate determination of the cardiac output, it is usually taken as 125 ml of oxygen per minute per square meter of body surface area. P is the oxygen tension, measured in Torr (mm Hg). If you want to obtain a realistic result, you need to supply our cardiac output calculator with some values first. Your height: quite simply, this is the measure of how tall you are. Your weight: similarly, a measure of how much you weigh. Basing on these two values, our cardiac output calculator will automatically determine your body surface area and the oxygen consumption. Hemoglobin: your blood test result. The normal values are 13.8 to 17.2 g/dL for men and 12.1 to 15.1 g/dL for women. Oxygen saturation (arterial blood): the ratio of oxygen-saturated hemoglobin to all hemoglobin in your arterial blood. For healthy adults, this value should be in the range of 94 - 99%. Oxygen tension (arterial blood: partial pressure of oxygen in arterial blood. This value should normally be in the range between 75 mmHg and 100 mmHg. Oxygen saturation (venous blood): the ratio of oxygen-saturated hemoglobin to all hemoglobin in your venous blood. For healthy adults, this value should be in the range of 60 - 80%. Oxygen tension (venous blood: partial pressure of oxygen in venous blood. This value should normally be in the range between 30 mmHg and 40 mmHg. Oxygen concentration (arterial blood) in ml/L. Oxygen concentration (venous blood) in ml/L. Cardiac output - the normal values should lie in the range from 4 to 8 L/min. Cardiac index - typical values are from 2.5 to 4 L/(min·m²) in healthy adults. 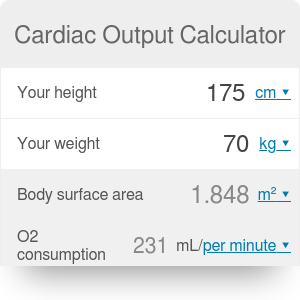 Cardiac Output Calculator can be embedded on your website to enrich the content you wrote and make it easier for your visitors to understand your message.